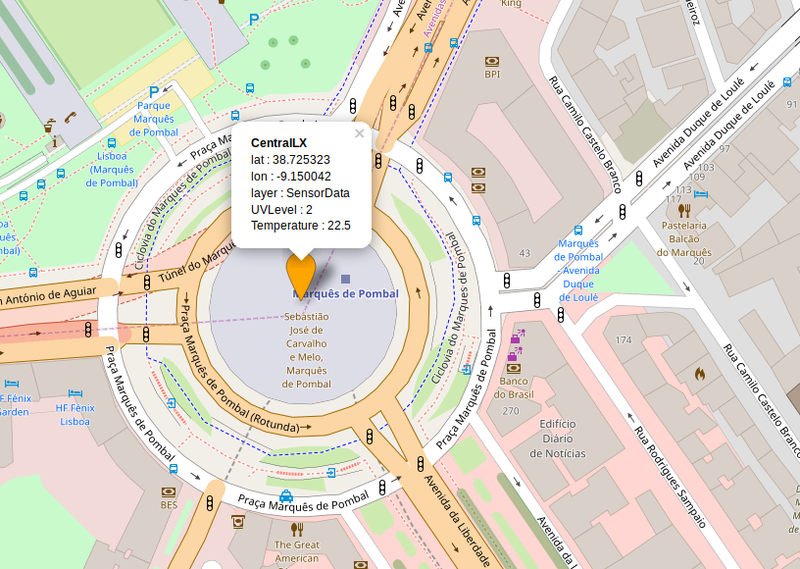 NodeRed Contrib World Map: Openstreet UI based map for plotting data with several options, including icon types, vectors, circles and heatmaps totally controlled through nodered flows. 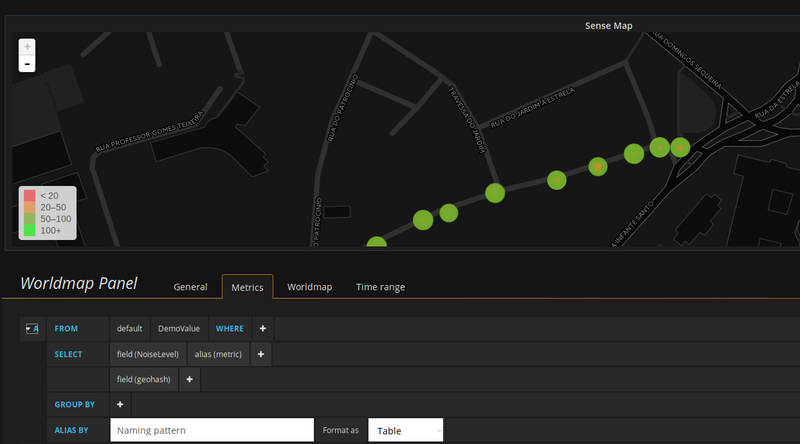 Grafana WorldMap plugin: Grafana panel with also an OpenStreet map for visualizing data. Both have pros and cons, but the main differences between the two is that Node-Red Worldmap is suited more to real time display, and the Grafana plugin is better adapted to display data based on some time based query. Other major difference is that Node-Red Worldmap would require some coding, but, at least I consider it, at an easy level, and the Grafana plugin is much harder to make it work. One of the easiest ways for mapping data in real time is using Node Red Worldmap node. The map is plotted and updated in real time. After restarting and deploying a worldmap node, the map should be available at: http://server:1880/worldmap or other URL depending on the Node-Red base configuration. One thing to keep in mind is that Node-Red is single user, so all instances of world maps (several different clients/browsers) will always have the same view. The simplest way to start using the worldmap is just to copy and deploy the demo workflow provided by the node, but the key concept is that each point has a name and a set of coordinates. The cool thing is that if we inject repeatedly the above message (keeping the same name) but with different coordinates, the data point will move across the map in real time, and as I said earlier, the move will be reflect onto every client. The Grafana Worldmap plugin can get the location data in several ways. One of them is to use geohash data that is associated to the values/measurements. Anyway for setting up the World map plugin to display the above data was not straight forward, so the following instructions are more for a startup point rather than a solution. Notice two important things: The aliasing for the query field to metric with the alias(metric) instruction, and the Format as: Table. On the Map Visual Options , I’ve centered the map in my location and set the zoom level. Fiddling around here can be seen in real time. On the Map Data Options for this specific example, the Location Data comes from a table filled with the previous query (hence the format as table on the query output), and we want to see the current values with no aggregation. When hoovering around a spot plotted on the map we can see a label: value, and the label used is obtained from a table field. In my case I just used geohash (not really useful…). Anyway these changes only work after saving and reloading the panel with F5 in my experience. 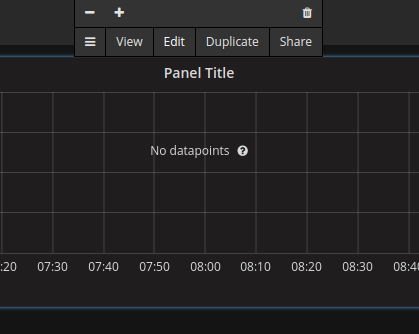 If we drag the selector on the left graphic panel, or select another time interval on top right menu of the grafana dashboard, the visualized information on the map changes. Our software stack installation ends with configuring and installing Grafana. Ubuntu installation instructions are at this Grafana documentation link.. In my case, the above instructions where enough to install successfully the software. 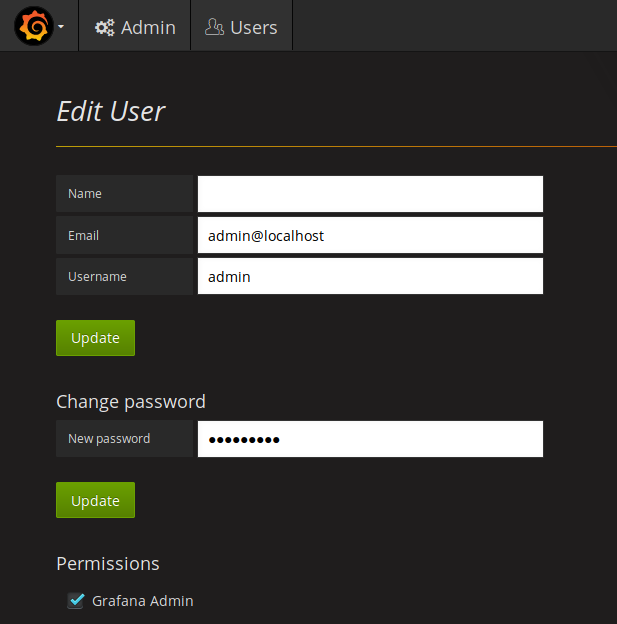 We can now start the Grafana server but if the server is exposed to the public internet the first thing to do is to change the default admin user password to something safe, or better yet, create a new admin user with a strong password and delete the admin default account. Here we also can create a new admin account, which is my recommendation. Dashboard data provides from data sources that we configure on Grafana. We can configure several data sources that we will used to fetch data to feed to our dashboards and graphs. In our case we will configure a single InfluxDB datasource. 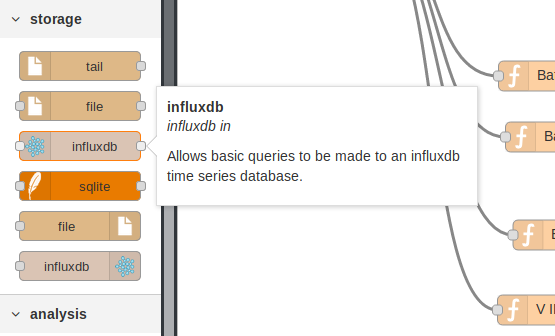 Note that we didn’t defined any authentication for the InfluxDB server, so no access credentials are needed yet, but we should set ones as soon as possible. 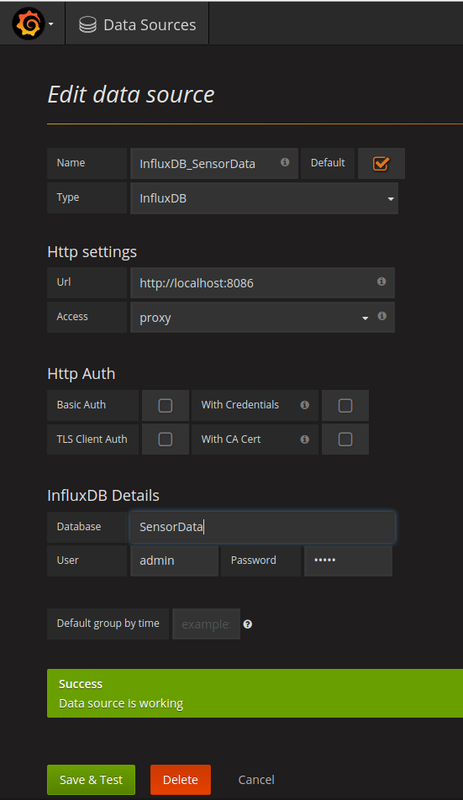 Since Grafana and InfluxDB are running on the same server we use the base URL http://localhost:8086. Make sure that the connection type is set as proxy. After setting the datasource name and datasource database, press Save & Test and it should report success. We are now able to create a basic first dashboard by building some charts/graphs based on the previous created data source. Press the New Dashboard button to create a new dashboard. In case that you don’t have a screen as the above screen shot, just press the top left Grafana Icon, select Dashboards and then New. The following screen should appear where we can add graphical panels to show our data. We should the way that we want to show our data, by selecting the Graph type. The selected graph type should reflect immediately on the panel below. To edit the panel source data we should press the panel title and a pop-up window will appear, and then we press Edit. We need now to press the Select Measurement and a drop down box with the available measurement should appear. We select the one that we want and data should now appear on the above graph. From now on is just a bit of perfecting things out like giving a sound name to the panel in the General tab and at the end pressing the Save icon on the top of the screen.